Today in the Traditional Missal under Mass "In Some Places and Congregations" is the important feast of Our Lady of La Salette. These are incredibly important words spoken by the Blessed Virgin Mary in her apparition to Melanie and Maximin and we need to hear these words in our current age of apostasy. LORD JESUS CHRIST, Who by Thy precious blood hast reconciled the world to God the Father, and hast deigned to make Thy Mother the Reconciliatrix of sinners, grant, we beseech Thee, that by the pious intercession of the same most blessed Virgin Mary we might attain forgiveness for our sins, Thou Who livest and reignest as God with the same God the Father in union with the Holy Ghost. Amen. The children were amazed to see that The Lady looked very sad and had tears streaming down her cheeks. She folded her arms over her breast. At first she spoke to the children in French but quickly started to speak to them in their own local dialect. Our Blessed Lady spoke over people swearing, not keeping the Sunday has a day of rest and disobeying Gods laws. Her words were very important and impressive: “If My people do not obey God, I shall be forced to let go of My Sons Hand”. This statement points to the last days of the world. Our Blessed Lady's sad expression, her tears, and words show us Her very real care for and sympathy with all people. “……. you’ll never be able to repay Me for what I have done for you. Our Lady asked us to pray a lot to save the world. She asked us all to confess our sins, turn away from our evil ways, do penance and pray. In La Salette Mary pointed out the great blessings and mercy of the holy rosary and begged us: “be reconciled with God”. During the period of time when she was appearing to both of the children, they were each individually given a secret. Maximin received his secret first and then Our Lady told a secret to Melanie. Whilst Our Blessed Lady was talking to Maximin, Melanie saw her lips moving, but could not understand what She was saying. Melanie says that both secrets were written down and were handed to Pope Pius 1X in 1851. Maximin never published the secret given to him, as he died before so doing. Cardinal Antonelli did give a copy of this secret to the Countess of Clermont-Tonnerre. A. Peladin in the “Annales du Surnaturel” published it in 1888.
a Protestant nation in the North will repent and proclaim their Faith. Because of this other nations shall return to God in faith. after this peace will be greatly disturbed by the ‘monster’! The (great) monster shall come at the end of the 19th century or at the latest at the beginning of the 20th century. What about the secrets given to Melanie in La Salette? The Blessed Virgin had said to her, “Melanie, what I am going to tell you now does not have to remain a secret. You may tell it in 1858” (this is the year that Our Lady appeared in Lourdes). These secrets told to Melanie have caused a lot of unrest and disagreement. Among other things, Our Lady told of the coming attempt to murder the Pope, which would not shorten his life. The prophetic language used by Our Blessed Mother, the painful truths She told and her announcement of Godly righteousness pending. People took these things very much to heart. Mary warned that faith would be lost on a large scale, leaving room for materialism, false teaching (Karl Marx published his communist manifest in 1848), spiritualism and many other sins. She continues: “all those who persecute the Church of Jesus Christ and all those people who have surrendered themselves to sin, will die and the earth will be like a desert. Then there shall be Peace, the reconciliation between God and man” (thus there will be people alive). Whilst these apparitions of Our Lady took place 153 years ago, these words are extremely relevant today. The given secrets are important to the entire development of the Church and the world until the end of the period of time. She asked the children to pray morning and night and if time was a problem, to at least say an Our Father and a Hail Mary. Finally, Our Lady said; "you’ll tell this to all my people”. This She repeated again. When Our Blessed Lady talks of Her people, She means everybody in the entire world who believes in Jesus Christ, Her Son. She spoke has The Queen of the World/ Queen of all Nations. Maximin tells us that the Lady was beautiful, great, a wonderful shining brilliant light, she wore a white cloak, a bright yellow apron, and her white shoes were decorated with roses of many colors. Roses were also clearly visible on Her crown. Around Her neck, She wore a chain on which was hanging a large cross with a hammer and pliers on the crossbar. Maximin also describes how they saw The Lady disappear. First, she was elevated to about one and a half meter high and then She faded and vanished before our eyes. Melanie said: “She must be a great Saint if we had known that we would have asked her to take us with her”. The children were horribly victimized, with threats, teasing, bribes and very mean tricks. But despite all this, their stories remained exactly the same time and again. 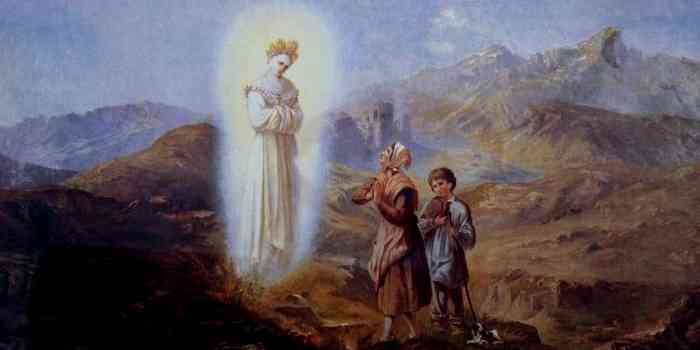 Finally, after a long and stringent examination of the facts, the Bishops formally recognized that Our Blessed Mother did appear to the children in La Salette. This was in 1851. Maximin died on the first of March 1875 at just 40 years of age. Melanie lived for many years in various convents in France, England, and Italy. She died 15 December 1904 and was put to rest in Altamura (Italy). The Real Meaning of the Messages of La Salette: Having told us the reasons for God’s anger, all our sins, disobedience, impurities, materialism, and pride. (St Maria Goretti is an example of purity), Our Lady implores us to change our ways and turn from sin to GOD. "This apparition in La Salette is fully approved by the Holy See: November 16th, 1851"